Sorry I haven’t posted recently! I’ve been busy! There are five things that I need to post about, and they are all going to be in this post! So, prepare yourselves for a long post! First up on the list of things to post about- the new island! The next island that the Poptropica Creators are going to release is called Game Show Island. Welcome to a future where robots rule. Building computers to compete on TV game shows seemed like a funny idea- until the machines wanted more. Now, after years of robotic dominance, Poptropica needs a savior. Are you clever enough to beat the robots at their own games, and restore the dignity of all Poptropicans? Enough about Game Show Island for right now! Second thing on the list of things to post about- The Money Ladder! 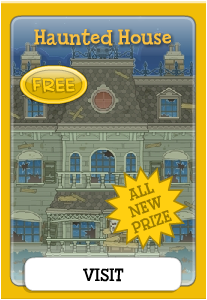 The Money Ladder is an all-new mini-game that has come to Poptropica. 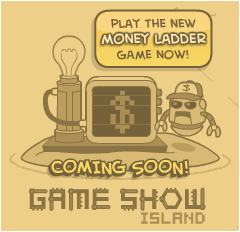 To play the Money Ladder, just go to your map, find Game Show Island, and click on the little bubble above Game Show Island that says “Play the new Money Ladder Game Now!”. Money Ladder is the game that pits Poptropicans against machines! Answer questions of increasing difficulty, earning dollars for each right answer. But be careful- one wrong answer, and you’re out! Do you have what it takes to reach the top of the Money Ladder? Be warned, though, the questions have nothing to do with Poptropica. Third thing on the list of things to post about- Poptropica’s Birthday Celebration. Time flies! 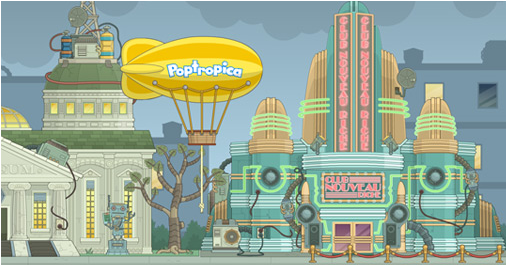 Poptropica’s fourth birthday celebration is almost over. The limited edition costumes that have been re-released to the store for the month of September are about to disappear. 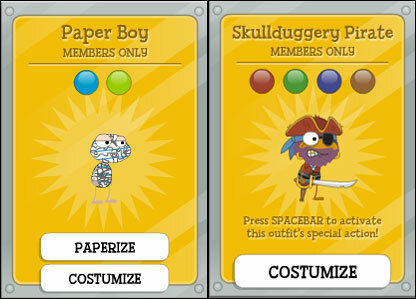 These costumes are available until the end of the day on Friday for Poptropica Members. Even if your Membership ends in the future, you’ll still have the costumes to keep forever. So what are you waiting for? If you’re a Poptropica Member, visit Poptropica and pick up your exclusive costumes from the Poptropica Store! If you’re not yet a Member, find out how to become a Member today. Besides these limited-edition costumes, you’ll also have Early Acess to all new Islands, including Mystery Train and Game Show Island! Our birthday may be almost over, but you can bet we have a lot more fun in store for Poptropicans in the months and years to come. Why, it’s still September yet, and we told you the Legend was coming this month. Tomorrow, we’ll let you know what that is! Fourth on the list of things to post about- The Legend! Last thing on the list of things to post about- the Haunted House mini-quest. Dr. Hare is on the loose again. This time he’s looking to catch a wave at a world-famous surfing spot. 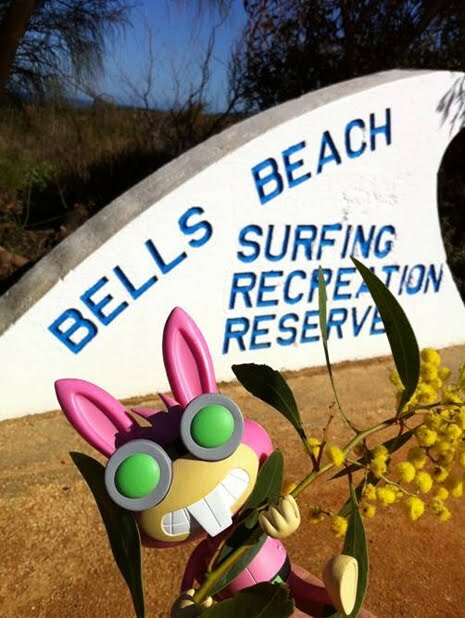 Dr. Hare was at Bells Beach, in beautiful Victoria. But wait! There’s more. 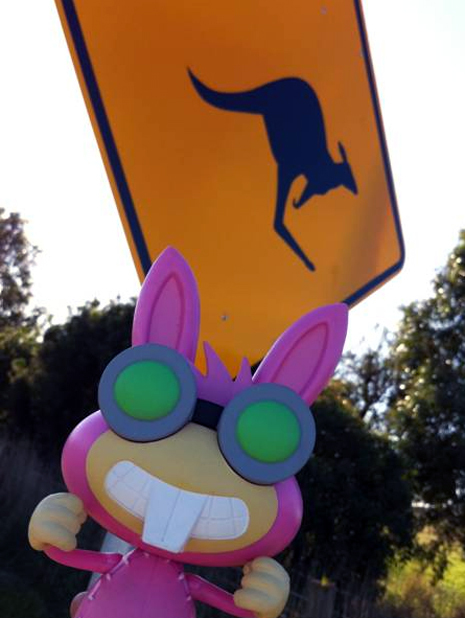 Now you can follow Dr. Hare in real time as he travels around the world with our interactive map. 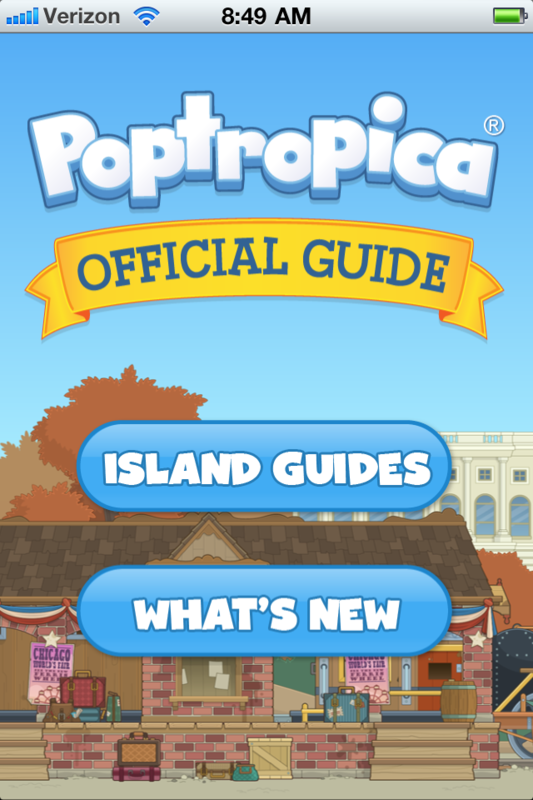 Once the official Poptropica guide is released, you will be able to go on a scavenger hunt around Poptropica. Here’s a post from the Poptropica Creators’ Blog, telling more about the scavenger hunt. The Poptropica guidebook will be available soon. We’re so excited about the publication of our first book that we’ve decided to ask all of you to help us celebrate! Starting on the book’s release date of October 13, we’ll be running a scavenger hunt based on the book. Each week, we’ll give you three clues, and if you enter the answers correctly, you’ll win special in-game prizes for your Poptropican! Find out more about the contest on our official scavenger hunt page. Hello fellow Poptropicans! There are just a few things that I need to post about. First, I am sorry to say this, but harrypotterhat is no longer an author on Icy Comet’s Blog. I know that all of us are going to miss her! Secondly, I am thinking about getting a new theme for Icy Comet’s Blog, so I will be trying out different themes over the next few days. Don’t be surprised if things look a little crazy. Lastly, here are three posts from the Poptropica Creators’ Blog that I am a little late posting about. 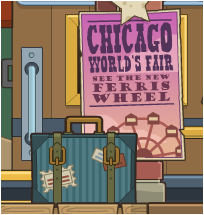 If you have yet to take a ride on the Mystery Train, visit Poptropica to get started. And we’ll look forward to seeing many more of you earn that Island Medallion! Here’s a sneak preview of something new we’re working on. You know the Poptropica Creators — we never phone it in. Mystery Train Island Available for Members! Mystery Train Island is now out for Members! You can now go to Poptropica and be the super-sleuth that you were born to be! Also, Non-Members can play a limited demo of the island. Mystery Train Island will be officially available for Non-Members in October. So, what are you waiting for? Head on over to Poptropica and jump on the train! Don’t care how, I want it now. But I’m no Veruca Salt. I can patiently wait for Mystery Train Island and the official guidebook, but I choose not to X). 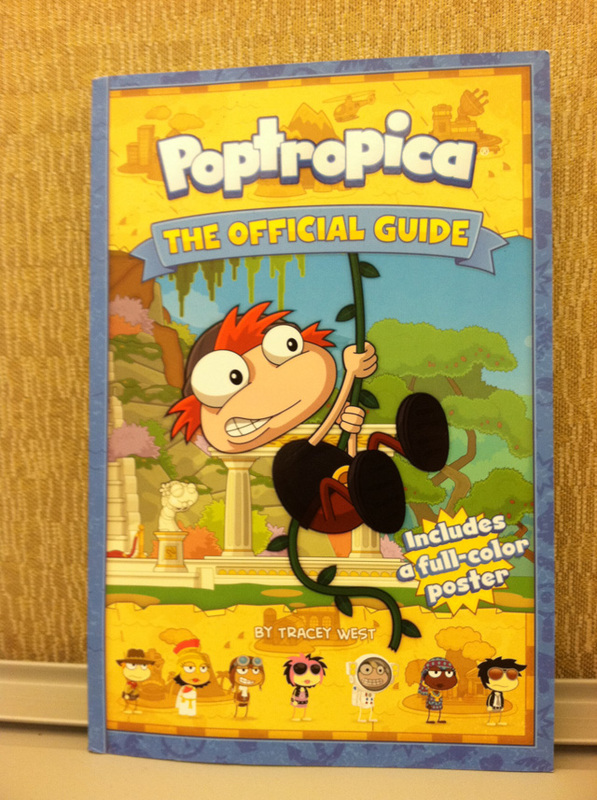 It’s a real, actual copy of the official Poptropica guidebook. And it looks great, even in an admittedly shoddy photo! This baby is 190 pages packed with full-color art, Island guides, and behind-the-scenes info straight from the Creators’ mouths. It even comes with a fold-out map that you can’t get anywhere else! 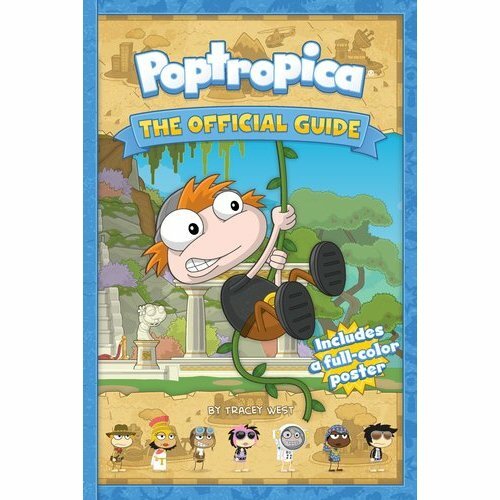 Poptropica: The Official Guide will be released on October 13, and is available for pre-order from Amazon.com. We’ll have more fun details about the book very soon! *glares at Captain Crawfish* What the heck? Captain Crawfish: That’s for throwing rotten fish at me. I never threw fish at you. Captain Crawfish: *to audience* Who throws fish at me all the time? My gosh, I hate you. Audience: You make us do it! Oh hi. Look at this post to see a new author. Hey. You. In there. See me? Ok, good. My name is Brave Tomato, also known as BT/ Eliza/ Fern, and yes, I joined ANOTHER Poptropica blog. Why? Because I like it. Well, a little bit about me… I am a 13-year-old girl that has creative bursts at times. And my Poptropican’s signature look is the star on the cheek. My favorite island is Mythology island and… Yeah. I admit I like mythology. I also work on Super Thunder’s Blog, the Huntresses blog, and Where Thunder Roars, as well as others. Am I starting to get too wordy? Ok then..
New Audience: Just end the post. Wanted: The Best Author in the World! Update: I’m not going to hire any more authors right now. I’ll do a post the next time I want to hire some more authors. That’s right, Icy Comet’s Blog is looking for a new author! If you are interested in becoming one, then go to the Become an Author page, and follow the instructions on that page. The Creators have added a timer on Poptropica, counting down the days, hours, minutes, and seconds until Mystery Train Island comes out. Here’s a post from the Poptropica Creators’ Blog, telling more about Mystery Train Island’s release. Have you got everything packed and ready for your ride on the Mystery Train? You’d better be, because it launches one week from today. We’re running a very tight schedule here, which is why if you visit the Poptropica homepage you’ll see a countdown timer that will take you to the second that the Island will become available. Here is a video from the Poptropica Creators’ Blog, it is a sneak peek of something the Creators are working on for a new island.